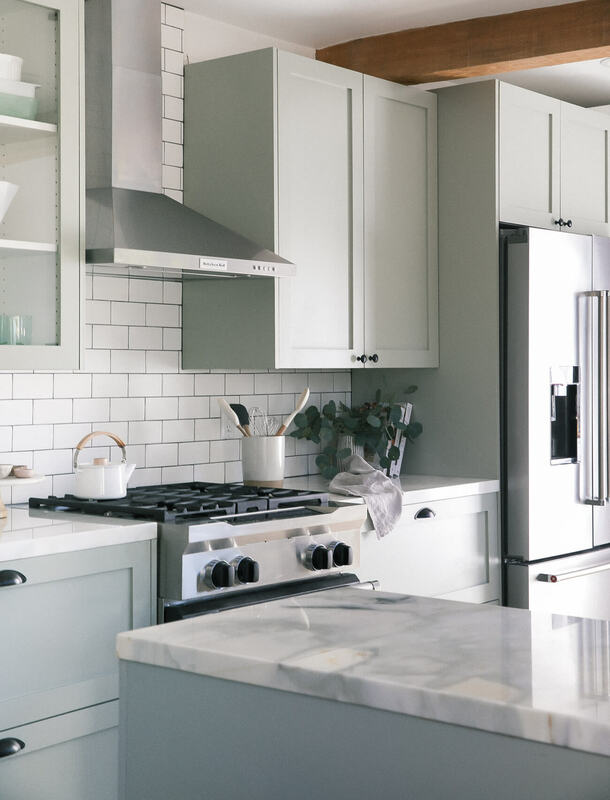 Los Angeles based blogger, Adrianna Adarme of A Cozy Kitchen spends most of her working day in her kitchen, so she knew that when the time came for a remodel it needed to be really special. Her little kitchen lacked practicality and had an unusual layout. She planned to use it for photoshoots in the future and wanted a beautiful backdrop whichever way the camera lens was pointed. And from the start knew she wanted to give her kitchen a nod to classic British style. 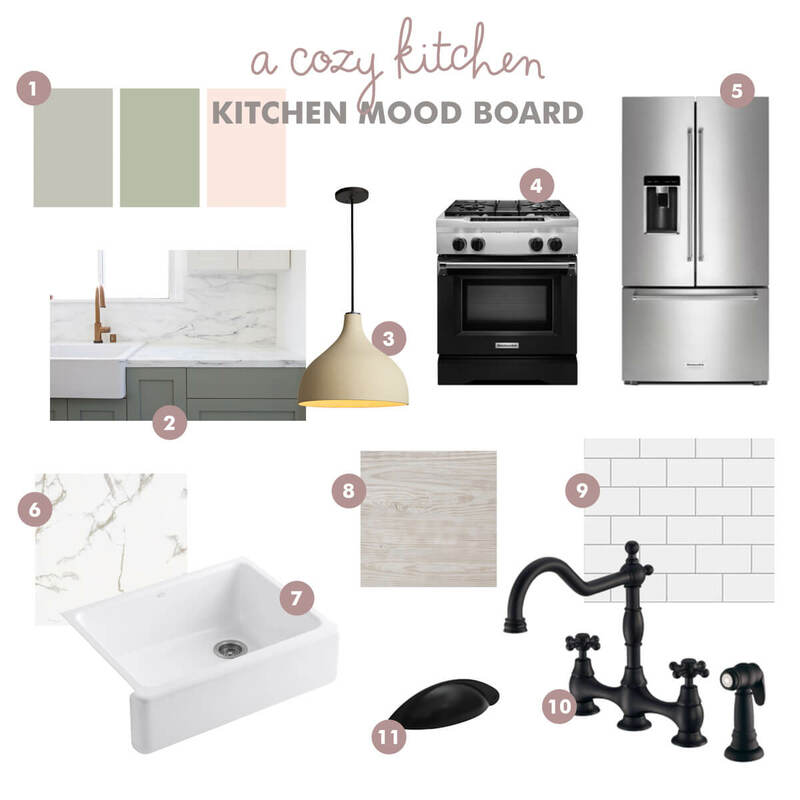 Putting together ideas on how to totally redesign her cooking and workspaces, Adrianna discovered that in creating a moodboard, it really helped to keep her country kitchen redesign on track. From the butler sink to the traditional mixer tap, she found inspiration online and then catalogued it to refer to along the way. This is a great way to ensure the colors and styles you plan to use will work well together as a whole. And one of the best ways to start building moodboards are on Pinterest. Adrianna’s goal was to create a unique country kitchen but was taken aback at the cost of a custom kitchen. 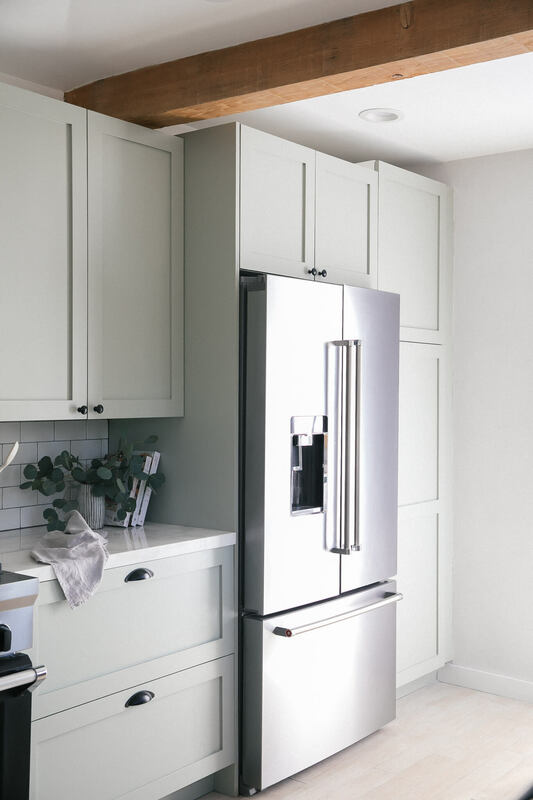 The beauty of using Semihandmade doors on IKEA cabinets means you get all the functionality and affordability of an IKEA kitchen with a high end custom finish and infinite color possibilities. To complete her kitchen, Adrianna chose to front her units in our popular DIY Shaker design. The doors were then custom painted in “Blue Green”, a country sage shade by British paint company Farrow and Ball. 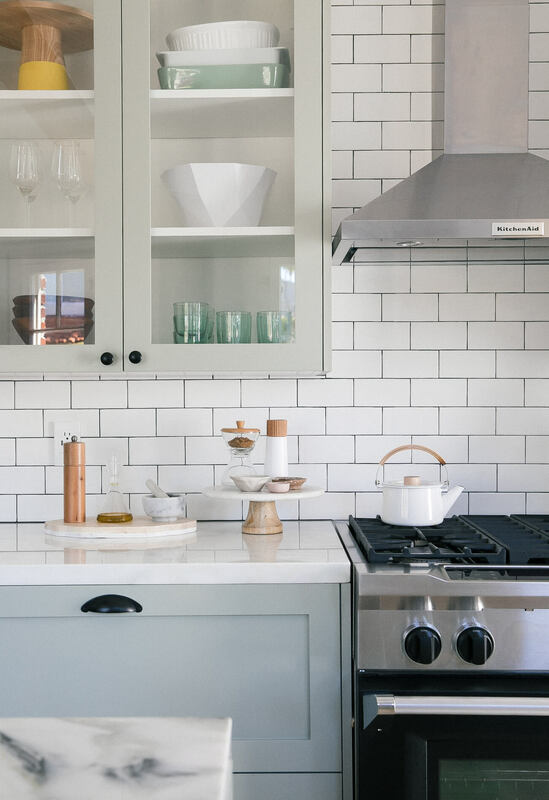 Once fitted, these were then topped with marble countertops, matte black hardware and subway tiles to give the traditional shaker design a really sleek modern edge. As in many period homes, Adrianna’s floors weren’t level which made fitting standard appliances a challenge. But, with some careful measuring and adjustments, they were made to fit like a glove. In taking down a partition wall between two rooms, she was also able to create enough space for a dining table and with the new windows above the sink in place, light now streams into her workspace. 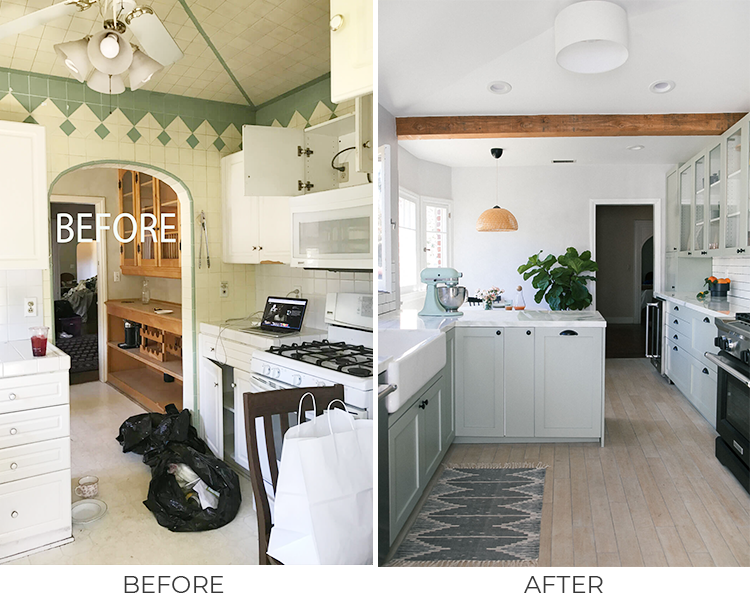 Adrianna’s renovation journey has been a great success but not without its stumbling blocks. Any problems were quickly overcome with the help of professional craftspeople, a clear vision and by following these key stages in the remodelling process. Take inspiration from images in magazines and online to create the perfect look and feel for your kitchen. Think about how you will use the space, whether the sink, oven and fridge are practically placed. Could replacing overhead wall units with floating shelving in a smaller kitchen or choosing light reflective tiles add space? Careful planning can help avoid design errors later on down the line. Having precise measurements is imperative to the kitchen remodel process so take your time to get them right. Once the old installation is removed, you may find you have more space than you initially thought. Call in a professional if you are unsure of how to measure correctly. Once you have taken your measurements and laid out your kitchen plans, Semihandmade is your next port of call. Browse our collection online to see which styles most suit your room. Think about choosing a simple color palette for cozy spaces, warm wood or calming hues. Once made, Semihandmade has some of the fastest lead times in getting your doors to you.